Knee action, how it relate to body movement. An exercise how to train the taiji way to use kua instead of the knee. Excellent video. Great concepts. Vital to being able to move forward without telegraphing, while moving forward with power. It also creates a step that has power that is difficult for the opponent to resist. I was intrigued when I saw the title of this video and thought, “now that’s something I need work on!” Imagine my surprise when I watched the video and realized not only was I there, but I’m in the video. And yet with many things one learns at seminars, by the following Monday, I had to almost be taught this concept again during my private lesson as there is so much to absorb in Master Chen’s seminars. Such is the value of the follow up videos, allowing one to view again the information presented in the seminar. 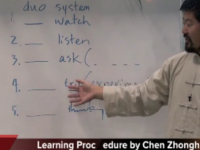 I’m very happy to see this video as I had forgotten some of what Master Chen discussed during his presentation of these concepts. Thanks again Master Chen for an absolutely fantastic time at the seminar and an invaluable private lesson.